Capsules contain d-mannose, a natural sugar that aids in cleansing bacteria from the urinary tract that may reduce the instances of UTIs. 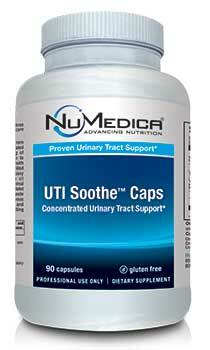 NuMedica UTI Soothe Capsules contain d-mannose. This simple sugar is naturally found in cranberries and pineapples. It works to cleanse the urinary track walls in an efficient manner. This product supports urinary tract health as a way to effectively remove E. coli from the body. 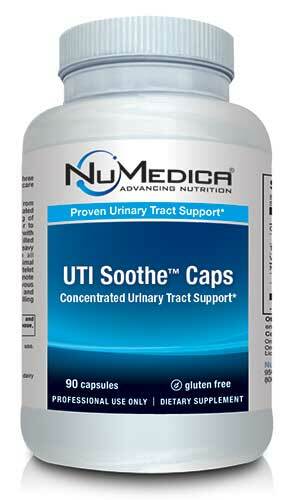 UTI Soothe Capsules help to maintain a healthy environment within the urinary tract's mucosal surface. When you take this product, it is absorbed by the upper portion of the gastro intestinal tract. As a result, it does not remove healthy, friendly bacteria or E. coli found in the colon, which is essential for maintaining a healthy environment. 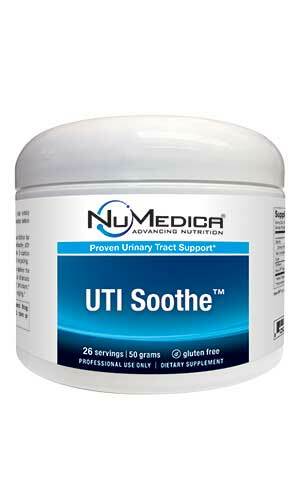 NuMedica UTI Soothe is also available in powder form. Small amounts of d-mannose are metabolized in the body while the rest is excreted through the urine. When flushed by the body, E. coli bacteria will wash away. These capsules, with a recommended dosage of two, contain 1,000 mg of d-mannose. D-Mannose is a type of simple sugar. It is found in some fruits including cranberries and pineapples. It may treat the deficiency brought on by a genetic defect that allows for abnormal breakdown and the production of mannose. In addition to meeting this need, this product also may help stop some types of bacteria from sticking to the urinary tract walls, which can lead to the development of painful infections. D-mannose treats carbohydrate deficient glycoprotein syndrome type 1b. The use of this supplement may be recommended in individuals who have this somewhat rare condition. In a healthy person, the body's immune system can fight off infection by controlling the amount and type of bacteria present in the urinary tract, colon, and other areas. However, in some people, an over abundance of bacteria or an inherited disorder can leave individuals vulnerable to infections that are both painful and can become severe. Taking NuMedica UTI Soothe Capsules may reduce the risk of this condition and pain because it supplements the body with the natural sugars needed to prevent bacterial spreading. UTI Soothe Capsules - 90c 2 Capsules 45 Take two capsules three or four times daily or as directed by your healthcare practitioner. UTI Soothe Powder - 26 svgs 1 Scoop (1.95 g) 26 Take one scoop (1 level teaspoon) three to four times daily mixed in water or non-citrus juice, or as directed by your healthcare practitioner. Other Ingredients: Rice flour, gelatin, vegetable magnesium stearate. Powder contains d-mannose, a natural sugar that aids in cleansing bacteria from the urinary tract that may reduce the instances of UTIs.